​it forward by giving back via time, talent, and treasure. Three members of the Andrews & Cole team volunteered their time in September of 2018 at SOME (So Others Might Eat). Their efforts helped to feed over 250 people. In September 2017, The Andrews & Cole team held a toiletry drive for N Street Village- a local non-profit that provides help to homeless and low-income women in the Metro DC Area. The drive was a success and the team is very appreciative of all who contributed. Members of the Andrews & Cole team returned to volunteer their mornings at SOME (So Others Might Eat) in September of 2017. Together they helped serve lunch to over 250 individuals. Andrews & Cole commenced its 15th anniversary week by making a gift to the Bethesda-Chevy Chase Rescue Squad (BCCRS) to honor the sixteenth anniversary of the September 11th attacks. BCCRS provides emergency medical, fire, and rescue services to communities throughout Montgomery County and upper Northwest DC. There are 150 individuals on the squad who provide 24/7 support to the community; funding for this service comes solely from the contributions of individuals and organizations. Three members from the Andrews & Cole team volunteered at the SOME kitchen in December 2016, preparing the dining room for over 250 guests. ​Andrews & Cole made a gift to SOME (So Others Might Eat) during the holidays that provided emergency groceries to 200 families. SOME is a community-based organization whose main goal is to help the poor and homeless of Washington, D.C. The organization provides a dire service as there are 7,298 homeless men, women, and children in our nation’s capital, and nearly one in five DC residents live below the poverty line. 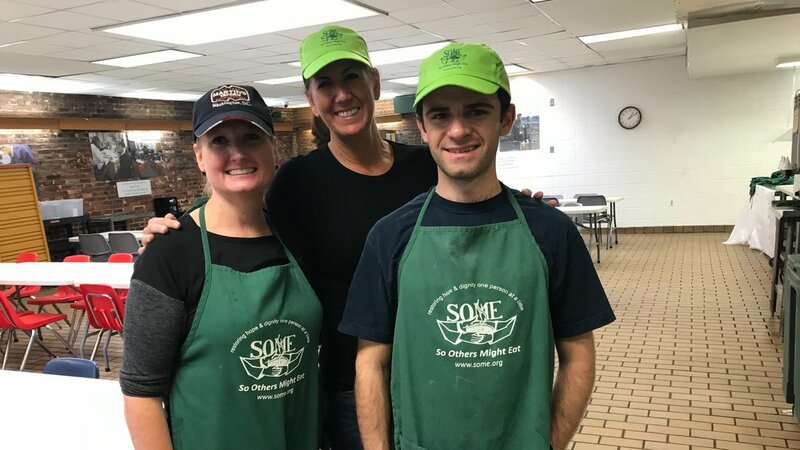 Three members from the Andrews & Cole team volunteered at the SOME kitchen in January 2016, serving hot meals to over 250 guests. Andrews & Cole is proud to provide financial support to Wounded Warriors, a non-profit organization whose goal is “fostering the most successful, well-adjusted generation of wounded service members in our nation’s history.” Wounded Warriors works to accomplish this through a holistic approach, in which they focus on aspects of soldiers mind, body and economic empowerment. This takes the form of services such as “Combat Stress Recovery Programs” and “Transition Training Academies”. Hire Heroes USA is a national non-profit organization that effectively trains and supports veterans all aspects of job search and career management. Our Founder, Nicole DelToro provides feedback on resumes and conducts mock interviews for veterans looking to join the civilian workforce. She shares her experience in the executive search realm to emphasize the importance of networking, professional development, and perseverance during a job search. After the interview, she provides the veterans with constructive feedback and areas for improvement moving forward. ​Andrews & Cole whole-heartedly appreciates the service of our military members, and is grateful to have the opportunity to work with them in starting the next chapter of their lives.